One of the largest and most important pesticide groups are the triazole-fungicides. They are employed for the control of a wide range of fungal diseases on fruit, vegetables, nuts, pulses, grain and seed crops and act systemically. Compounds such as triadimefon, cyproconazole, propiconazole, epoxiconazole and tebuconazole all contain the 1,2,4-triazole moiety and metabolize to 1,2,4-triazole (TRZ) and to three more common metabolites, namely 1,2,4-triazole alanine (TA), 1,2,4-triazole acetic acid (TAA), and 1,2,4-triazole lactic acid (TLA). These four main common metabolites of triazole fungicides are known as triazole derivative metabolites (TDMs). TDMs are very polar by nature and their analysis is very challenging. The use of isotopically labeled internal standards (IL-IS) helps to eliminate quantitation errors related to matrix-effects and has opened the way for a straightforward sample preparation via the QuPPe method, without any cleanup step. Direct analysis of TDMs by LC-MS/MS, however, has proven to be difficult due to strong signal interferences caused by co-eluting peaks, which strongly compromise the LOQs and the accuracy. To improve selectivity Differential Mobility Spectrometry (DMS), a variation of Ion Mobility Spectrometry (IMS), was employed. Using DMS, recovery experiments at 0.01, 0.1 and 0.2 mg kg-1 in fruit and vegetables and at 0.02, 0.2 and 0.4 mg kg-1 in milk and rice resulted in highly satisfactory recovery and precision figures overall. TRZ, the least sensitive among the TDMs, partly failed to comply with the precision criteria at the lowest spiking level. More than 4600 conventional and organically labelled products from the local market were analyzed for TDM residues with high percentages of the samples being found to contain residues exceeding the LOQ. TA was the TDM compound most frequently detected. Roughly half of the conventional and one third of the organically labelled products contained it at levels ≥ LOQ. TLA and TAA were also frequently found whereas TRZ exceeded the LOQ only rarely. Our findings suggest a long persistence of the TDM-moiety in the environment. Triazoles are systemic fungicides that are employed for the control and treatment of a wide range of fungal diseases on fruit, vegetables, nuts, pulses, grain and seed crops . All pesticides belonging to the above group contain the 1,2,4-triazole moiety and are metabolized to four main common metabolites known as triazole derivative metabolites (TDMs): 1,2,4-triazole (TRZ), triazole alanine (TA), triazole acetic acid (TAA), and triazole lactic acid (TLA). The formation of triazole pyruvic acid has also been reported but seems to be less pronounced. The chemical structures of the 4 main TDMs are shown in Table 1. Other pesticides of lower importance with a potential of releasing the 1,2,4-triazole moiety include the growth regulator triapenthenol, the triazole herbicide amitrol and the acaricide azocyclotin. The 1,2,4-triazole moiety appears to be relatively stable in the environment and has the potential to be found in crops, livestock and the environment (e.g. soil and water) mainly in form of TRZ, TA, TAA and TLA. All these forms inter-convert in the environment and may be also taken up by succeeding crops. The degree of formation of these metabolites in plants, animals and the environment depends on the type of the pesticides applied and many other factors. TA, TAA and TLA form the main fraction of residues in plant commodities. TRZ is rarely detected as such in products of plant origin and is reported as a main metabolite in soil. TRZ has been, also reported to be formed at significant rates in livestock tissues following intake of triazole fungicides (e.g. in the case of flusilazole  and tetraconazole ). TA is formed when TRZ conjugates with serine, and TAA is subsequently formed from TA via oxidation. In various plant-metabolism studies TRZ levels in plants ranged from 0 to 17 % TRR (Total Radioactive Residue), TA levels from 0 to 89 % TRR and TAA levels from 0 to 76 % TRR. TLA was not investigated in these early studies [4, 5]. At the Joint FAO/WHO Meeting on Pesticide Residues (JMPR) in 2008, an Acceptable Daily Intake (ADI) of 0–0.2 mg kg-1 bodyweight and an Acute Reference Dose (ARfD) of 0.3 mg kg-1 bodyweight was established for TRZ. TAA and TA were considered to be of low acute toxicity when administered orally and therefore no ARfD was established. A group ADI of 0–1 mg kg-1 bodyweight per day was assigned for TAA and TA individually or in combination by the JMPR . In 2011, the European Food Safety Authority (EFSA) published a Reasoned Opinion about the modification of the existing Maximum Residue Levels (MRLs) for difenoconazole. EFSA defined toxicological reference values for the TDMs as follows: for TRZ and TAA the ADI was set at 0.02 mg kg-1 bodyweight per day and the ARfD at 0.06 mg kg-1 bodyweight. For TA the ARfD was set at 0.1 mg kg-1 bodyweight and the ADI at 0.1 mg kg-1 bodyweight per day . For TLA toxicological reference values are still pending. In a Peer Review report on tebuconazole EFSA highlights the need for separate risk assessments for parent triazole fungicides and TDMs, which raises the need to set separate residue definitions for TDMs covering TRZ, TAA, TA and TLA . An EFSA document summarizes the residue situation of TDMs in primary and rotational crops tested within the framework of metabolism studies of 13 14C-labelled triazole pesticides . According to this summary the parent triazole pesticides are the most prominent residues in crops treated with triazole fungicides. Among the TDMs TA is the most important one found in primary crops. TLA and TRZ remain insignificant in primary crops whereas TAA is mainly found in cereals. In rotational crops the parent triazole fungicides are only found at insignificant levels whereas TDMs are found at high levels. TA is the most prominent TDM in rotational crops with levels up to 0.5 mg kg-1 in cereal grains. TAA is most important in cereal grains and cereal straw whereas TLA is most significant in leafy crops, root crop tops and cereal straw. TRZ accounted for less than 2 % of the total radioactive residue in rotational crops. Interestingly TDM-residue levels at 1 month plant-back intervals are typically lower than at a 3–4 months plant-back interval. Between 3–4 months and 10–12 months intervals the decline is rather moderate. It was concluded that the residues in rotational crops mainly result from the uptake of TRZ originating from the degradation of triazole pesticides applied previously. TRZ is then metabolised by plants to triazole alanine, triazole lactic acid and triazole acetic acid. Apart from the metabolism of pesticides to TDMs within the same growing season, TDMs can potentially also originate from applications in previous growing seasons. Furthermore, 1,2,4-triazole may also originate from other sources. It is for example known that 1,2,4-triazole is used in industrial manufacturing of pharmaceuticals. 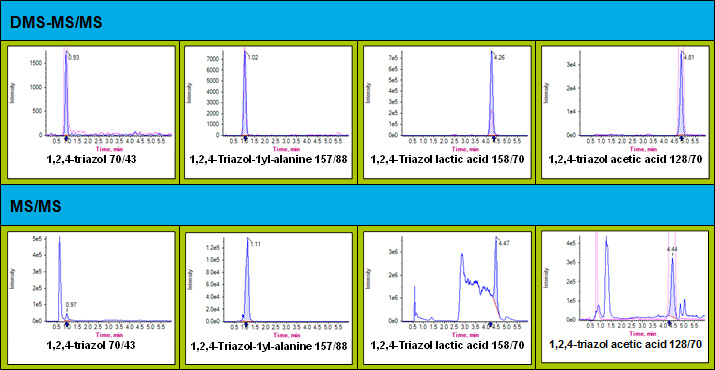 1,2,4-triazole and some other compounds containing the 1,2,4-triazole moiety (e.g. 4-amino-1,2,4-triazole and 3-mercapto-1,2,4-triazole) are reported as nitrification inhibitors, which are compounds added to fertilizers and manure to slow down naturally occurring nitrification by bacteria [9, 10]. To which extent these and other sources contribute to the TDM-levels encountered in crops remains to be investigated. Triazole fungicides are well amenable to most pesticide multiresidue methods with the QuEChERS method being currently the most widely employed approach . However, very few methods are available for the quantification of TDMs, which behave very differently from the parent triazoles. TDMs are highly polar compounds of low molecular weight, which makes their quantification in complex samples very difficult. Westberg  developed a method for the determination of TRZ, TA and TAA in a variety of plant and animal matrices (derived from a Bayer CropScience draft method). The residues were extracted with methanol:water (80:20, v/v), and purified through two different SPE cartridges, followed by two derivatization steps. In the case of TAA, C18 SPE cartridges were used for purification and HCl/butanol was used for esterification. For TA, BondElut Certify II SPE cartridges were used for purification and two derivatization steps were performed; firstly: HCl/butanol for esterification, and secondly: HFBA for acylation. TRZ was directly derivatized with dansyl chloride. These procedures are very laborious and difficult to implement for the analysis of large numbers of samples. Schermerhorn et al. developed several methods for the determination of 14 parent triazole fungicides and three TDMs (TRZ, TA and TAA) in apples, peaches, flour and water. Following extraction of crops with methanol or acetonitrile the extracts were cleaned up by a combination of C18, mixed-mode cationic and mixed-mode anionic SPE columns and analyzed by LC-MS/MS. The determination of highly polar compounds is still a challenge and requires special conditions of extraction and instrumentation. With the aim of capturing as many of such pesticides as possible within one method, the EURL-SRM (EU Reference Laboratory for pesticides requiring single residue methods) has introduced the QuPPe (Quick Polar Pesticides) method  involving simultaneous extraction of all pesticides followed by a number of LC-MS/MS runs covering different groups of compounds. Direct LC-MS/MS analysis of TDMs is possible, but there are strong limitations due to the small number of diagnostic ions and strong chromatographic and mass spectrometric interferences caused by co-eluting matrix-compounds. The introduction of an additional degree of selectivity, such as high resolution mass spectrometry or ion-mobility spectrometry would thus be helpful. Jasak et al. developed a method without a clean-up or derivatization process, which involves an easy extraction step and applies Differential Mobility Spectrometry (DMS). For the extraction, a solution of methanol-water (80:20, v/v) was used. After filtration, the extract was diluted to a volume of 100 mL with the extraction solvent. 2.5 mL thereof were evaporated to the aqueous remainder and reconstituted in 1 mL water. LC-separation of TRZ, TAA and TLA was performed on an Aquasil C18 column. For TA a Hypercarb column was used. DMS is a method for separating ions based on their differing mobility in gas flows at or near atmospheric pressure when applying certain types of electric fields. One of the main benefits of DMS is the enhancement of selectivity, identification certainty and quantitative accuracy as a result of a pre-separation of isobaric and even isomeric ions, based on mobility differences as a result of a different molecular shape. DMS is a variant of the Ion Mobility Spectrometry . In the beginning, HR-MS was also considered as potential method for the determination of TDMs. However, in preliminary tests it was less promising than DMS. The objective of this work was therefore the inclusion of TDMs within the QuPPe method scheme using DMS, their successful validation in different commodities at low levels and the initiation of a monitoring program to assess the residue situation in different crops. This information will hopefully be useful when it comes to conducting a risk assessment of these compounds and to deciding whether there is a need to separately regulate TDMs. By analyzing products of organic production the study should further help to assess the typical background levels and practical limits of quantification/reporting. Methanol and acetonitrile of gradient grade were purchased from Merck (Darmstadt, Germany). Formic acid of excipient grade and acetic acid of analysis grade were also purchased from Merck (Darmstadt, Germany). Water for liquid chromatography was deionized in our laboratory using a Direct-Q 3 UV Ultrapure Water Purification System (Billerica, MA, USA). Dry ice for sample comminution was delivered in blocks by a local provider and stored at -80 °C. For the dispersive SPE cleanup POLYGOPREP 300-30 C18 from Macherey-Nagel (Düren, Germany) was used as a sorbent. The analytical pesticide standards and the isotopically labeled internal standards (IL-IS) of the four triazole metabolites were kindly donated from Bayer CropScience (Monheim, Germany). An individual stock solution of 1 mg mL-1, considering standard purity, was prepared in methanol. Only TA was prepared in water:methanol (3:1, v/v). The combined stock solution of the four internal standards was prepared in methanol and diluted with methanol to 10 µg mL-1 and 1 µg mL-1 (working solutions). All solutions were stored in the dark at 4 °C. For the linearity and recovery experiments four different commodities (oranges, milk, rice and cucumbers) of organic production were used. All commodities were tested for triazole fungicides and TDMs. Low levels of TA (below 0.001 mg kg-1) were found in rice and cucumbers. The milk used for these experiments contained approximately 0.002 mg kg-1 TRZ. Frozen samples were chopped with dry ice using a Prime Cut UM5 universal machine from Stephan Machinery GmbH (Hameln, Germany). Dry samples were ground at room temperature using a Grindomix GM 200 knife mill by Retsch (Haan, Germany). The centrifuge Rotanta 460 by Hettich (Tuttlingen, Germany) was used, which is appropriate for the centrifuge tubes employed in the procedure. Pipettes were from Eppendorf (Hamburg, Germany): electronic pipettes applicable for volumes of 10–100 μL and 200–1000 μL and manual pipettes applicable for volumes of 1–10 mL. Analytical balances capable of weighing down to 0.1 mg or to 0.01 g were from Mettler-Toledo (Greifensee, Switzerland). The Fortuna Optifix 10 mL Universal Dispenser was used to add solvent to the samples. The automatic dispenser system Opus (20–50 mL; Ex 20 °C; Hirschmann Laborgeräte, Eberstadt, Germany) was used for the dilution of the working solutions. 50-mL PP (114×28 mm) single-use tubes with screw caps for the sample extraction were from Sarstedt (Nümbrecht, Germany). 1.5-mL LC autosampler vials and 20-mL screw-cap vials were from Ziemer GmbH (Mannheim, Germany). 6-mL single-use syringes from Henke Sass Wolf (Tuttlingen, Germany) and disposable cellulose mixed esters syringe filters (0.45 µm pore size, 25 mm diameter) from Machery-Nagel (Düren, Germany) were used to filter the QuPPe extracts as well as the formic and the acetic acid before use. For LC-MS/MS analysis of the QuPPe extracts an Agilent 1200 HPLC system (Agilent, Waldbronn, Germany) consisting of a binary pump, a standard autosampler and a column oven were used. It was connected with a SelexION Q-Trap® 5500 mass spectrometer (AB SCIEX, Darmstadt, Germany), which was run in ESI positive mode. The samples were injected on a Hypercarb 2.1x100 mm column with 5 µm particle size (Thermo Fisher Scientific, Waltham, USA), equipped with a Hypercarb Guard Column (2.1x10 mm, 5 µm particle size, Thermo Fisher Scientific, Waltham, USA) and a Supelco column saver (2 µm-pre-column filter, Sigma-Aldrich, Steinheim, Germany). For the QuPPe method 10 ± 0.1 g (in the case of cereals 5 ± 0.05 g) of the prepared samples were weighed into 50-mL PP tubes. The water content was adjusted by adding the following volumes of water: milk 1.2 mL and rice 10 mL (rice was let to soak for 10 min). Afterwards 10 mL of methanol + 1 % formic acid followed by 50 µL of the internal standard working solution (10 µg mL-1) and the spiking solutions were added to the samples. The tube was closed, shaken for one minute and centrifuged for 5 min at 4000 rpm. The methanol phase was filtered through a syringe filter (0.45 µm) into autosampler vials. The extracts were subjected to SelexIon® (DMS-) LC-MS/MS measurement. In the case of milk the raw extract was cleaned up by dispersive SPE as follows: 4 mL of centrifuged raw extract were poured into a screw capped vial containing 200 mg C18 sorbent (= 50 mg C18 sorbent/mL raw extract) and 4 mL acetonitrile. The dilution with acetonitrile served to precipitate certain protein fractions. Following a 1 minute shaking the vial was centrifuged for 5 min at 4000 rpm and the extract was filtered through a syringe filter and measured as described above. The LC-analysis on the Hypercarb column was optimized to obtain a good peak-shape and a satisfactory retention of the compounds. The flow rate was set to 0.6 mL min-1. The mobile phase A consisted of 1 % acetic acid in purified water, containing 5 % methanol. The mobile phase B consisted of 1 % acetic acid in methanol. The following gradient program was applied: starting at 100 % of mobile phase A (0 % B) at injection time, gradually changing to 10 % A (90 % B) over 5 minutes and maintained at 10 % A for another minute. Afterwards, the mobile phase composition was shifted back to the starting conditions within 0.1 minutes and kept for approximately 9 minutes in order to re-equilibrate the column. Total run time was 15 minutes, the injection volume 2 µL and the column temperature was set to 40 °C. The MS/MS detection was performed by multiple reaction monitoring (MRM) using an ESI interface in positive mode and by using the [M+H]+ of each of the 4 compounds as parent ion. To determine the MS/MS transitions and optimize the instrument settings for each compound, standard solutions of the individual compounds at a concentration of 0.02–0.05 µg mL-1 in methanol containing 0.5 % acetic acid were directly infused to the ion-source at a flow rate of 10 µL min-1 using a syringe pump. The ion spray voltage was 5500 V, the curtain gas was nitrogen at 40 psi, the nebulizer gas and the turbo gas were synthetic air, both at 60 psi, the source temperature was 550 °C and the collision gas was set to “medium”. The DMS parameters (temperature, separation voltage (SV) and compensation voltage (COV)) were optimized to obtain the best combination of sensitivity and separation. To start with, a solution containing all the compounds at a concentration of 0.1 µg mL-1 was infused directly into the MS via syringe pump. The signal intensities of the [M+H]+ ions were checked at the three preset temperatures of the DMS device (low, medium and high). The temperature with the highest signal intensities was then used for further optimization. The SV was ramped from 0 to 3,500, firstly, in increments of 500 V subsequently in increments of 100 V within a selected narrower range. The COV was ramped from -20 to 15 volt. Figures 1a and 1b show exemplarily the signals obtained during the instrument setup procedure of TRZ. The optimal DMS temperature obtained for each compound was “low” in all cases and was therefore utilized in most following experiments. After identifying the most suitable SV-COV combination for every single substance using the syringe pump, further fine-tuning of the COVs around the preliminary value was performed using the LC method (fixed SVs and DMS temperature). This step is necessary as the COV is strongly influenced by the flow rate and composition of the mobile phase. There are additional options for improving the separation of ions by SelexIon®. One possibility is the utilization of modifiers, another one the application of a throttle gas (DMS Resolution Enhancement). Modifiers like e.g. 2-propanol, acetonitrile or methanol can be added to the gas flow, affecting the mobility of the ions, which may increase the separation. The application of a throttle gas (low, medium or high) against ion flight direction in the DMS-cell reduces the DMS transport gas flow and therefore increases the dwell time of the ions in the DMS-cell, which may also result in a better separation . In any case we considered the TDMs separation achieved using the optimized settings for SV, COV and temperature being satisfactory and did not contemplate testing these additional options. The procedure was validated on homogenates of cucumber (high water content), orange (high water content and acidic) and polished rice (high starch content and low water content) as well as whole milk. Blank homogenates were spiked at 0.01 mg kg-1, 0.1 mg kg-1 and 0.2 mg kg-1 (n = 5). For milk and rice the spiking levels were selected to be twice as high in order to end up with comparable analyte concentrations in the final extracts. In the case of rice this was a result of the halved sample portion whereas in the case of milk the analyte amounts spiked were doubled to account for the 1:1 dilution of the final extract. The QuPPe procedure was followed by LC-MS/MS and LC-DMS-MS/MS analysis. Matrix-matched calibration standards at concentrations representing 60 % and 120 % of each spiking level were used for each matrix and a calibration curve not forced through the origin was constructed in each case to be used for quantification. Isotopically labelled analogues of the TDMs (IL-ISs) were used as internal standards to correct for any recovery losses or possible differences in matrix effects. Solvent based calibration standards were also tested and shown to be comparable with the matrix-matched ones and thus principally suitable for calibration, provided that IL-ISs are being used. For the DMS optimization, three different parameters were investigated: DMS temperature, SV and COV. Since the highest signal intensities were observed with the DMS temperature set at “low”, this set up was used for the optimization of the SV and COV. They were optimized without modifiers or throttle gas. The MS/MS-transitions as well as the corresponding optimized MS/MS and DMS settings of each compound are shown in Table 2. *In the case of TRZ there was no second suitable ion transition so m/z of 70/70 was used. See also Figure 3, which shows the positive effect of the DMS module on the chromatograms of parent/parent “transitions”. The COV and the SV directly influence the separation of compounds (and the signal intensity as well). Typically, higher SV or COV values, either positive or negative, improve the separation of analytes from matrix components, improving the signal-to noise- ratio. 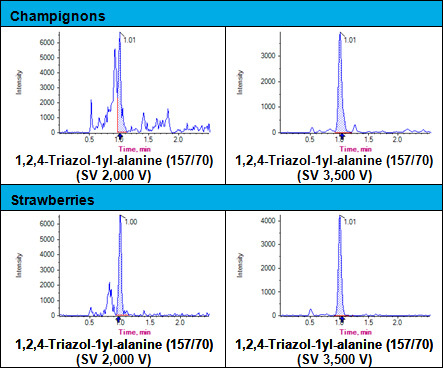 As an example, Figure 2 shows TA in champignon and in strawberry matrix at two different SVs. In this set-up (DMS temperature was set on “high”), the highest signal intensity was observed at an SV of 2,000 V. Due to a better discrimination of interfering matrix components the signal-to-noise-ratio was however much better at an SV of 3,500 V.
It is noted that when adapting the described method to other instruments, optimization of DMS settings may be needed for all analytes, since the optimal settings may vary from instrument to instrument. This applies even more if different mobile phases are used. DMS provides a remarkable separation from isobaric interferences thus allowing to selectively detect ions even if not fragmented in the collision cell. This form of detection had to be chosen in the case of TRZ, a compound with only one sufficiently sensitive ion transition (m/z = 70/43). Nevertheless, thanks to DMS the 70/70 “transition” could be detected selectively enough making this signal suitable for identification purposes (see also Figure 3). MS/MS chromatograms often show strong signal interferences caused by co-eluting matrix compounds, which compromise the usefulness of this technique not only for quantitative but also for qualitative screening. In general TRZ and TLA are more affected by interferences compared to TAA and TA. As an example, Figure 4 shows the LC-MS/MS and LC-DMS-MS/MS chromatograms of a parsley sample containing incurred residues of all four TDMs. While the use of DMS leads to a drop in the signal intensity, it also leads to an improvement of the signal-to-noise ratio. Using MS/MS, a strong interfering peak close to the retention time of the compound is characteristic for TRZ chromatograms. This makes it impossible to quantify but also difficult to evaluate the presence or absence of this analyte (in a screening situation). 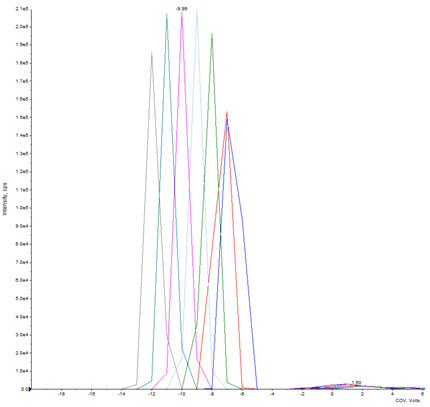 Using DMS-MS/MS the TRZ chromatograms obtained are mostly free of interfering peaks. 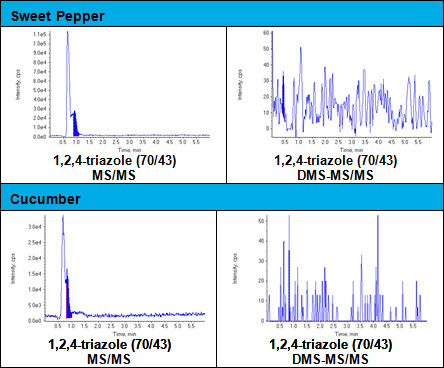 This is demonstrated nicely in Figure 5, which shows exemplary MS/MS and DMS-MS/MS chromatograms of the TRZ target mass transition, obtained from sweet pepper and cucumber extracts. In both cases co-eluting interferences were effectively removed by DMS. Similarly, TLA is also often affected by matrix interferences in the MS/MS mode that are also eliminated by using DMS-MS/MS. 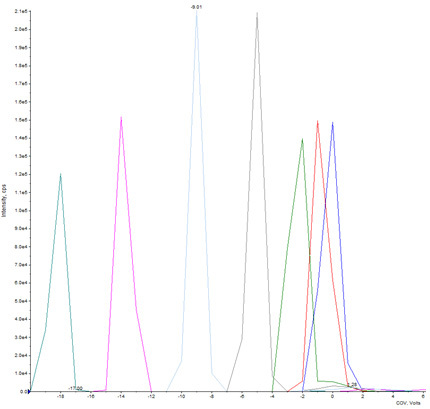 Exemplary chromatograms of gooseberry and peach extracts are shown in Figure 6. Before validating the method, the linearity of measurement was checked for each substance in the range between 0.005 and 0.20 µg mL-1 in methanol using the signal ratios against the IL-IS. In all cases correlation coefficients were greater than 0.990. In a separate experiment matrix effects were examined for some commodities by comparing the slopes of calibration curves obtained from standards in pure solvent with those obtained from equally concentrated standards in blank extracts of cucumbers, oranges, rice and milk. Each series included one blank and five calibration solutions with concentrations ranging between 0.005 and 0.10 µg mL-1 of each substance. The matrix effect for each pesticide-matrix combination was calculated by forming the ratio between the slope of the matrix-based calibration curve and the respective solvent-based calibration curve and expressing it in percent. As shown in Table 3 TA showed the most pronounced matrix-induced signal suppressions (lower slopes). Calculating with IL-ISs matrix effects could be effectively compensated, which indicates that solvent-based calibrations can be used in this case. Other than shifting the slope of the calibration curves, matrix slightly broadened the peak-shapes in the case of milk. The retention times (peak apexes) were however not affected by more than 1 %. *IL-IS of TRZ was not available at the time. For the validation of the method, the precision and accuracy were determined based on five replicate recovery experiments (n = 5) for each of the three spiking levels (shown in Table 4). The mean recoveries for TRZ, TAA, TA and TLA were overall satisfying and ranged between 75–108 %. The RSDs ranged between 5 and 20 % with exception of TRZ in oranges and cucumbers with RSDs of 22 % and 27 % respectively at 0.01 mg kg-1. For TRZ no IL-IS was used in the case of rice and milk (it was not available at the time of the validation). *Three commodities contained negligible levels of one or two TDMs (s. Chemicals and other materials), which were considered in the calibration curve. **IL-IS of TRZ was not available at the time. In a separate experiment using slightly different DMS settings (not shown here) the method was additionally validated at 0.01 and 0.1 mg kg-1 on grapes, avocados, potatoes and barley flower. This validation also showed satisfying mean recoveries between 86 and 119 % and RSDs between 1 and 19 % (see Table 5). As a criterion of identification the ion ratios of the quantifier ion versus the qualifier ions of the four TDMs were examined in all four commodities and spiking levels of the validation experiment. For this the ratios in the samples were compared with the rations in the calibrations. At the 0.2 mg kg-1 level the 30 % maximum deviation criterion (document SANTE/11945/2015)  was met in all cases. At the 0.1 mg kg-1 level the criterion was met in > 97 % of the cases and at the 0.01 mg kg-1 level it was only met in 89 % of the cases (mostly failing to pass slightly). Comparing the ion ratios in milk, rice and oranges against those in cucumbers (acting as a random matrix for calibration) the compliance with the 30 % criterion dropped to around 96 % at the 0.1 mg kg-1 level. Overall the identification criteria seem to be achievable with more frequent failings occurring at the lowest level (0.01 mg kg-1). The method was applied to 4,689 samples (thereof 642 organic) from the local market. Routine calibration curves covered a range between 0.01 or 0.02 mg kg-1 and 0.2 or 0.4 mg kg-1 (depending on the commodity). In case of residue findings exceeding this range, extracts were diluted and reanalyzed. TA was the most frequently found TDM exceeding the LOQs in 1,969 (49 %) of the conventional samples and in 194 (30 %) of the organic samples. The TLA analytical standard became available only later; therefore, only 3,413 samples (thereof 441 organic) were analyzed, but it exceeded the LOQ in 699 (24 %) of the conventional samples and in 52 (12 %) of the organic samples. TAA exceeded the LOQs in 440 (11 %) of the conventional samples and in 63 (10 %) of the organic samples. TRZ was only found exceeding the LOQs in 55 (1.4 %) of the conventional samples and in 6 (1 %) of the organic samples. TA was frequently encountered in many commodity types, including stone fruit (87 % of conventional samples contained residues exceeding the LOQs), cereals and cereal products (86 %), sprouting vegetables (74 %), potatoes (70 %), pome fruit (66 %), root vegetables (63 %), cultivated mushrooms (80 %), fruiting vegetables (45 %); exotic fruit (43 %), leafy vegetables (40 %), berries (38 %), and citrus fruit (28 %). TLA was most frequently encountered in conventional stone fruit (49 %), pome fruit (43 %), berries (35 %), potatoes (26 %), exotic fruit (31 %), citrus fruit (24 %) and leafy vegetables (19 %). TAA was most frequently encountered in conventional cereals and cereal products (60 %), cultivated mushrooms (65 %), stone fruit (27 %), exotic fruit (23 %) and citrus fruit (16 %). TRZ was rarely detected in most commodities with exception of milk with 75 % of the conventional samples containing levels ≥ LOQ, fruit juices (23 %, with 70 % of the grape juices showing levels ≥ LOQ), cultivated mushrooms (24 %) and baby food (11 %). Our findings comply well with the overall residue patterns described in the summary document by EFSA  with TA being the most prominent among the TDMs and TAA being especially important in cereals. Table 6 shows a summary of TDMs-findings in conventional and organic products. *LOQ: 0.01 mg kg-1 (0.02 mg kg-1 for cereals, dry pulses, dried mushrooms and milk). A more detailed table of the TDMs findings is attached in the Annex, both for conventional and organic products. Table 7 shows the average TA concentrations (mean levels in samples containing residues ≥ LOQ) and the percentage of positive results for selected products with sufficient numbers of conventional and organic products having been analyzed (n≥12). In primary commodities the average TA-concentration in conventional products was roughly 2–3 times higher than in organic products. Cereals and stone fruit were the commodities with the highest average TA-levels (both in organic and conventional products). In baby food the average TA-concentration in organic products was higher than in conventional products, but this is surely related to the different average composition of the products (e.g. cereal content). Conventional products were found to contain TA-levels at or above the LOQ more frequently than organic products, with exception of cereals (86 % versus 94 %). The largest differences between conventional and organic products both in terms of average TA-levels and frequency of findings where observed in leafy vegetables (0.089 vs 0.031 mg kg-1 and 40 % vs 18 % positives). Overall TA was the predominant TDM in terms of average residue concentrations (of the positive results). Notable among the other TDMs is the predominance TLA in exotic fruits (0.153 mg kg-1 on average in conventional products, with the highest values being detected in mango, pineapples and papayas), berries including grapes (0.048 mg kg-1 on average in conventional products, with the highest values being detected in currants) as well as in wine. TAA was predominant in cultivated mushrooms (0.074 mg kg-1 on average in conventional products). This correlates well with the information compiled by EFSA  indicating high TAA levels in cereal straw, which is widely used as a substrate to cultivate mushrooms. In contrast, none of the wild mushrooms analyzed contained any TDM residue ≥ LOQ. Overall TDM residues in conventional products were more frequent and on average the levels found were significantly higher than in products labelled as organic. This suggests a link between TDM-residues and conventional agricultural practices. Assuming that the use of triazole fungicides is the main contributor of TDM-residues the frequent TDM findings in organic products (up to 26 % for TA overall with 94 % in cereals and 76 % in stone fruit) and the relatively high average concentrations of the positive samples (0.066 mg kg-1 for TAA and 0.056 mg kg-1 for TA overall) is rather surprising and needs to be thoroughly studied. Based on experience with the analysis of organic samples, pesticide drift from neighboring fields and false declarations of conventional products as organic do not play such an important role to explain those findings (the average levels in organic produce are typically > 200-fold lower than in conventional). To our knowledge, no significant natural occurrence of the 1,2,4-triazole moiety has been reported. Other possible sources to be considered include: a) current use of triazole pesticides by a large percentage of organic farmers (illegal and rather unlikely in this extent); b) current use of 1,2,4-triazole-containing nitrification inhibitors (NIs) by a large percentage of organic farmers (illegal and rather unlikely in this extent unless farmers use the NIs unintentionally, e.g. through commercial fertilizers for organic production containing them); c) use of triazole pesticides prior to conversion to organic farming and contamination of organic samples through old residues remaining in the fields or trees; d) use of NIs prior to conversion to organic farming. Although d) cannot be fully excluded it appears unlikely as nitrification inhibitors not containing the 1,2,4-triazole moiety seem to be more popular among farmers (e.g. nitrapyrin, NBTPT, DMPP and dicyandiamide). Given the high frequency of TDM findings and their relatively high average concentrations option c) seems to be the most likely source of the residues in organic products. Judging from the rather moderate growth of organically cultivated land in recent years, it can be assumed that the vast majority of the organic producers have switched to organic farming several years ago and have most likely not applied any triazole-fungicides or NIs for some time. This suggests that at least one of the components containing the 1,2,4-triazole moiety shows a very high persistency and a limited leaching potential (despite its high polarity). An active uptake by succeeding plants seems furthermore to take place. To clarify the situation long term studies (over many years) would be required to assess the dissipation and leaching potential of TDMs both individually and as a sum to account for their potential inter-conversions. Same applies to the persistence of these residues in fruit trees (especially stone fruit trees) and their potential “recycling” through the fall of leafs. Our study demonstrates that the QuPPe method is well applicable for the analysis of TDMs. The quantification achieved by LC-DMS-MS/MS shows a higher selectivity compared to MS/MS. For qualitative purposes, LC-MS/MS is a good alternative, but for compounds such as TRZ and TLA strong matrix interferences often prevent a proper judgement. Validation of the method on representative commodities (cucumbers, oranges, potatoes, avocados, rice and milk) using LC-DMS-MS/MS has shown satisfying recoveries and RSDs demonstrating that TDMs can be reliably quantified and identified down to 0.01 mg kg-1 in fruit and vegetables and down to 0.02 mg kg-1 in milk and cereals. Moreover, the routine monitoring of more than 4600 conventional and organic samples from the local market yielded many TDM findings. The frequency of organically labelled products containing TDMs at or above the LOQ as well as the relatively high mean concentrations in organic products suggest a persistence of the TDM-moiety over many years. The analytical pesticide standards and the isotopically labeled internal standards (IL-IS) of the four triazole metabolites were kindly donated from Bayer CropScience (Monheim, Germany). Schermerhorn, P. G. et al. (2005) J. AOAC Int. 88, 1491–1502. 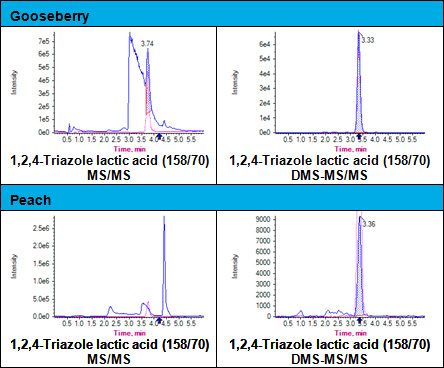 Determination of 22 Triazole Compounds Including Parent Fungicides and Metabolites in Apples, Peaches, Flour, and Water by Liquid Chromatography/TandemMass Spectrometry. [2 ]European Food Safety Authority, EFSA Journal (2013) 11 (4):3186. Reasoned opinion on the review of the existing maximum residue levels (MRLs) for flusilazole according to Article 12 of Regulation (EC) No 396/20051. European Food Safety Authority, EFSA Journal (2013) 11(5):3223. Reasoned opinion on the modification of the existing MRLs for tetraconazole in commodities of plant and animal origin. [4 ]U.S. Environmental Protection Agency, Michael Doherty et al. (2006) DP 322215. 1,2,4-Triazole, Triazole Alanine, Triazole Acetic Acid: Human Health Aggregate Risk Assessment in Support of Reregistration and Registration Actions for Triazole-derivative Fungicide Compounds. FAO, (2009) Plant Protection Paper 193, p. 355–346. Triazole metabolites. European Food Safety Authority, EFSA Journal (2011) 9(5):2153. Modification of the existing MRLs for difenoconazole in beet leaves (chard), globe artichokes, broccoli, cardoons and strawberries. [8 European Food Safety Authority, EFSA Journal (2014) 12 (1):34851. Conclusion of the peer review of the pesticide risk assessment of the active substance tebuconazole. D. W. Nelson, D. Huber, NATIONAL CORN HANDBOOK, NCH-55, Iowa State University, 1992, electronic version 2001. Nitrification Inhibitors for Corn Production. EU Reference Laboratory for Single Residue Methods. Qick method for the analysis of numerous highly polar pesticides in foods of plant origin via LC-MS/MS involving simultaneous extraction with methanol (QuPPe-Method). Jasak, J. et al. (2012) J. AOAC Int. 95, 1768–1776(9). Analysis of Triazole-Based Metabolites in Plant Materials Using Differential Mobility Spectrometry to Improve LC/MS/MS Selectivity. European Commission, Directorate-General for Health and Food Safety. SANTE/11945/2015 Guidance document on analytical quality control and method validation procedures for pesticides residues analysis in food and feed. * Positive samples (containing TDM-residues at levels ≥ 0.01 mg kg-1, in the case of cereals, processed cereals, dry pulses, dried mushrooms and milk ≥ 0.02 mg kg-1). ** The mean value refers to the positive samples.